We will touch down in Israel at Ben Gurion airport near the city of Tel Aviv. Tel Aviv was originally named Ahuzat Bayit, meaning “acquisition of a home”. It was founded by 60 families in 1909 as an all-Jewish neighborhood near Jaffa. In 1910, the name was changed to Tel Aviv (Abib), meaning “Ancient Hill of Spring.” The name was taken from Ezekiel 3:13-17, “…and I came to the exiles at Tel-abib”. A “Tel” is a mound of ancient civilizations. Within these mounds lay the remains of civilizations piled one on top of the other. “Aviv” represents the first month of the spring harvest and is the same month God set His people free from slavery in Egypt. After Tel Aviv, our first experience in the Holy Land will be at the ancient sea port of Jaffa. 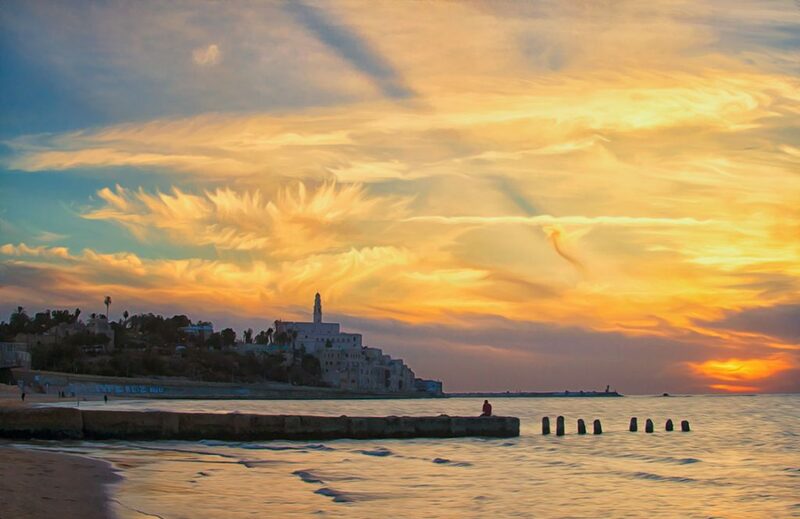 In our January Newsletter you learned that Jaffa was the very place the Jewish exiles from Europe returned to restore and rebuild their homeland. The Jews, boarding poorly equipped ships headed for a safe haven to rest the soles of their feet. Finding no country that would open their doors, many sailed onward to the port of Jaffa. 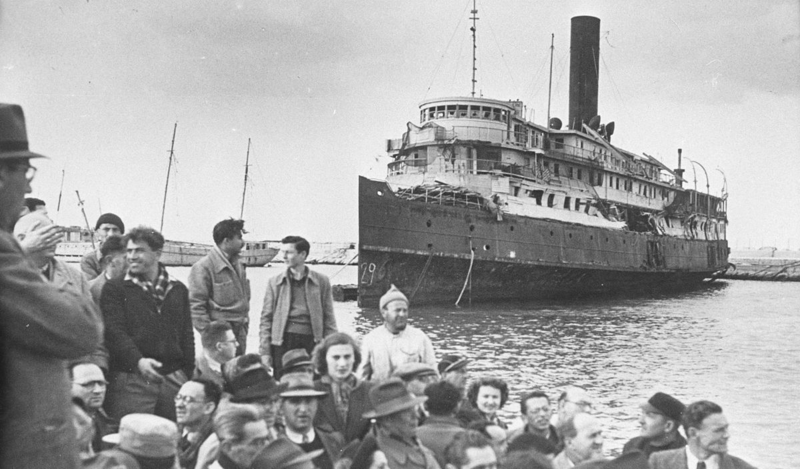 As new Jewish immigrants flooded the shores, those that had remained in “Palestine” found new hope for their survival. Thus began the intense labor pains of building a nation and defending themselves from their enemies. They cleared the swamps and planted gardens while guarding their children with picks and shovels. Leaving our luggage at the hotel in Tel Aviv, we will walk down the gorgeous sandy beach of the Mediterranean to view the port of Jaffa, meaning “beautiful”. This is the oldest port city in Israel, giving access to the heart of the land. When the Egyptians invaded Canaan, one of their prime targets was Jaffa. It was one of the cities conquered by Egyptian Pharaoh Thutmose III (1458-1425 BC), and resulted in the conquest of Canaan. Egyptian scarabs, seals, or small good luck charms were found in excavations along with the earliest documented peace agreement dating back to the reign of Ramses II, (1279-1213 BC). Along with the gods of Egypt, the lintel of the gate bearing the title of Ramses II was unearthed in Jaffa and a replica now stands where it was found. In Jaffa/Joppa, the LORD called upon Jonah, meaning “Dove”, to go to Nineveh (modern day Mosul in Iraq). Most of us know the account, as Jonah fled from the presence of the LORD, he boarded a ship in Jaffa bound for Tarshish, the complete opposite way to Nineveh. Solomon, the son of King David, developed Jaffa into Israel’s major seaport. Using the port of Jaffa, the King of Tyre sent silver, gold, cedars and much more to Solomon to build a permanent dwelling for the LORD. Cyrus, King of Persia, “in order to fulfill the word of the LORD”, released the Hebrews to go back to Jerusalem to rebuild the Temple that was destroyed by Nebuchadnezzar. At Joppa/Jaffa, we read of a disciple named Tabitha (Dorcas), who fell sick and died. Peter came to her side, knelt down and prayed. Tabitha was healed and many believed in the LORD. The hillazon-murex trunculus is a sea creature that was found in 1990 by a Rabbi/scientist along the shore of the Mediterranean. He discovered the secretion from a tiny gland of this sea creature provided the only acceptable blue dye, called “tekhelet”, for the Temple fabrics and blue cords of fringe that hang from the four cornered garment of the Jews. Numbers 15:38. This incredibly rare color was thought to be lost forever, but after thousands of years it has been rediscovered and is now being used for the new Temple as well as the cord for the corners of the prayer shawls. Now headed north, up the Mediterranean coast to Caesarea, a city that Herod the Great dedicated to Caesar Augustus more than 2,000 years ago. Caesarea Maritime was a major Roman political center built on the site of an old town called Strato’s Tower, located on the road from Egypt to Tyre, about 70 miles NW of Jerusalem. Herod the Great built Caesarea in 22-10 BC., and it became capital of the Roman province of Judea as well as the residence of powerful men like Festus, Felix, and the other Roman procurators. Cornelius, a Roman centurion, was the first Gentile convert. Acts 10. Peter first took the message of the Gospel to the Gentiles at Caesarea. The place of the frightening account of Herod Agrippa I, who was smitten by an angel of the Lord. Acts 12:21-23. 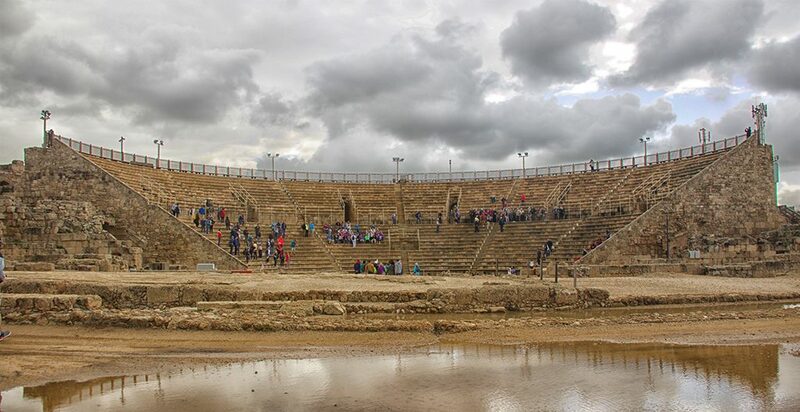 In Caesarea, we will visit this ancient sea harbor, aqueduct, hippodrome, and sit in the magnificent amphitheater where many events took place. 1. Herod the Great (ruled 37-4 B.C.) He’s the guy in the Christmas story. Super powerful king answerable to Rome. He’s the guy who tried to trick the wise men and killed the baby boys in Bethlehem, Matthew 2 (not to mention some of his own sons and wives). Not cuddly at all. Actually, you wouldn’t invite any of these Herods to become your “bosom friend,” but especially not “the Great.” Herod the Great was a master builder or at least knew the guys to hire. He also built the palace of Masada and began the building of the Western Wall. 3. Herod Antipas (ruled 4 B.C.-A.D. 39) Jesus called him “that Fox”, Luke 13:32. He received a quarter of his father’s territory (Galilee and Perea). He divorced his first wife and married Herodias, the wife of his brother (who was yet a different “Herod”). Herod Antipas was the Herod who killed John the Baptist. Matt 14:10. Pontius Pilate sent Jesus to see this Herod as part of His trial since this Herod was visiting Jerusalem at the time Jesus was sentenced to death. Did you know that Pilate and Herod Antipas became friends on that day? Luke 23:12. 4. Herod Philip the Tetrarch (ruled 4 B.C.-A.D. 34) This Herod got the remaining quarter of his father’s territory and married his niece, Salome, the daughter of Herodias (Herod Antipas’s wife-of-sin). Matthew 14:1-12. 5. Herod Agrippa I (ruled A.D. 37-44) Grandson of Herod the Great and nephew of Herodias. Agrippa I eventually ended up ruling over more territory than his grandfather, Herod the Great. In the book of Acts, he is known as the one who put Peter in prison Acts 12:1-19. Also, “He did not give God the glory” when referred to as a god by the people of Tyre and Sidon and was thus struck by an angel and “eaten by worms” Acts 12:20-23. 6. Herod Agrippa II (ruled A.D. 50s until long after the end of the Jewish war; died around A.D. 93) Like his father Herod Agrippa I and great-grandfather Herod the Great he ruled over a large territory. He’s the one who interviewed Paul along with the Roman procurator Porcius Festus when Paul was imprisoned in Caesarea after Paul’s third missionary journey Acts 25-26. Agrippa exclaimed to Paul, “In a short time you will persuade me to become a Christian…” Acts 26:28. This Herod completed the building of the Western Wall. 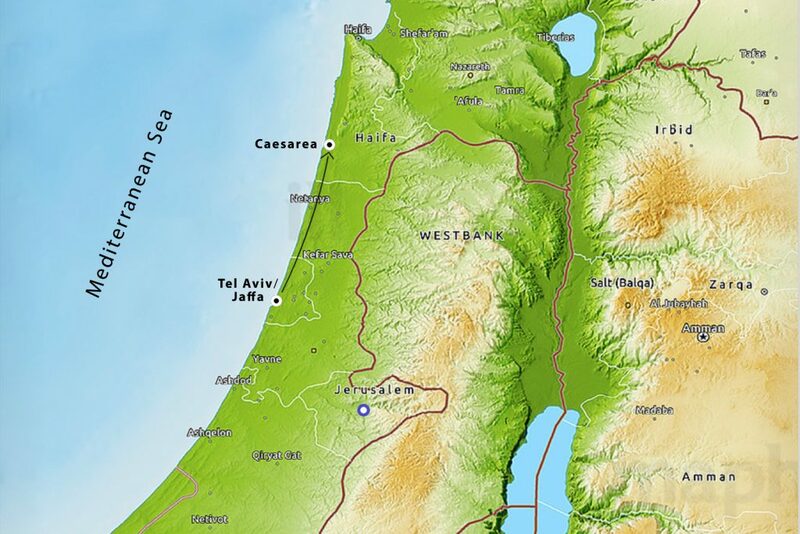 The Nation of Israel is situated in southwestern Asia along the eastern end of the Mediterranean Sea, Israel extends about 200 miles North and South and 70 miles East and West; at its narrowest, just north of Tel Aviv (Yafo or Jaffa), it is 12 miles across. The land of Israel was promised to Abraham by the LORD early in the Bible, “On that day the LORD made a covenant with Abram, saying, ‘To your descendants I have given this land…” Genesis 15:18, and then confirmed to Abraham’s son Isaac, “I will be with you and bless you, for to you and to your descendants I will give all these lands, and I will establish the oath which I swore to your father Abraham.” Genesis 26:3. Once again God’s covenant promise was given to Isaac’s son Jacob, “I will give it to you and to your descendants.” Genesis 28:13. 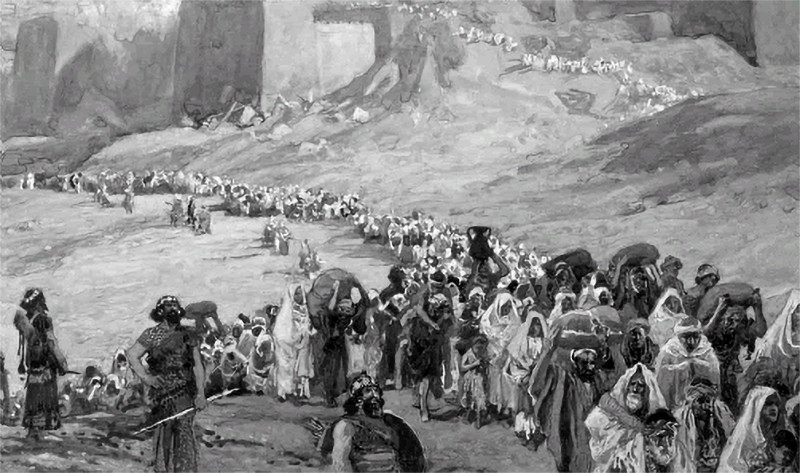 The Promised Land was described in terms of the territory from the Red Sea to the Euphrates River. Exodus 23:31. 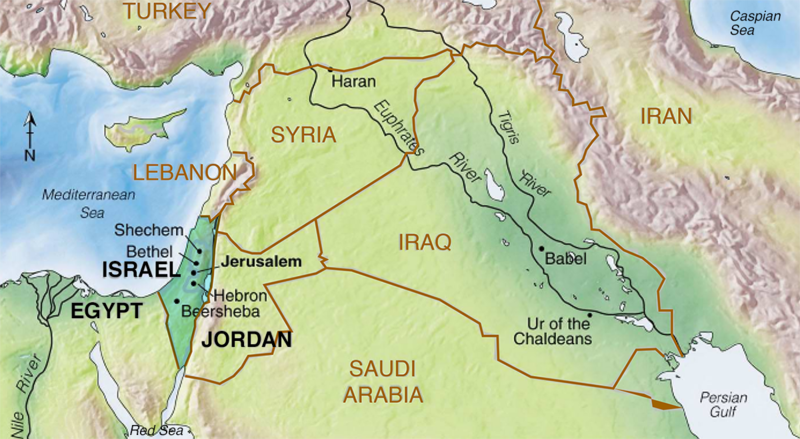 Israel is bordered on the North by Lebanon, on the East by Syria and Jordan. On the South it is bordered by the Gulf of Aqaba (Gulf of Elat), and on the South West by Egypt and on the West by the Mediterranean Sea. Comparatively, the area of Israel is slightly smaller than the state of New Jersey. The LORD gave over 22 prophecies that the nation of Israel would be scattered to the four winds of the earth. Zech. 7:14 states, “but I scattered them with a storm wind among all the nations whom they have not known, Thus the land is desolated behind them so that no one went back and forth, for they made the pleasant land desolate.” The nation was dispersed in 70 A.D. to the four corners of the world, however, the LORD would not let His people be forsaken forever, He would bring them back with an outstretched arm. The LORD God foretold through His prophets He would restore His nation. Through the prophet Hosea God declared, “For the Israelites will live many days without king or prince, without sacrifice or sacred stones, without ephod or idol. Afterward the Israelites will return and seek the LORD their God and David their king. They will come trembling to the LORD and to his blessings in the last days.” Hosea 3:4-5. The Nation of Israel would dwell for many years outside of their Promised Land. After this time had elapsed God would return to them to their ancient possession. The predictions were exact and complete making the nation’s return a supernatural happening of our age. A prophecy by God fulfilled as a modern miracle. The LORD spoke through many of His prophets and declared He would bring them back to their homeland. “I will bring you from the nations and gather you from the countries where you have been scattered – with a mighty hand and an outstretched arm and with outpoured wrath.” Ezekiel 20:34. Isaiah declared: “In that day the Lord will reach out his hand a second time to reclaim the remnant that is left of his people from Assyria, from Lower Egypt, from Upper Egypt, from Cush, from Elam, from Babylonia, from Hamath and from the islands of the sea. He will raise a banner for the nations and gather the exiles of Israel; he will assemble the scattered people of Judah from the four corners of the earth.” Isaiah 11:11-12. God used the prophet Jeremiah around 600 B.C. to tell the world that God’s people would be taken captive, but when they returned they would buy the land and the LORD would restore their fortunes. That is precisely what returning Jews did, starting nearly a century ago – they bought back the land. “Men shall buy fields for money, sign and seal deeds, and call in witnesses in the land of Benjamin, in the environs of Jerusalem, in the cities of Judah, in the cities of the hill country, in the cities of the lowland, and in the cities of the Negev; for I will restore their fortunes, declares the LORD.” Jeremiah 32:44. Not only would the people return, but they would also become their own sovereign nation again, and as prophesied, they would be reborn in a day. 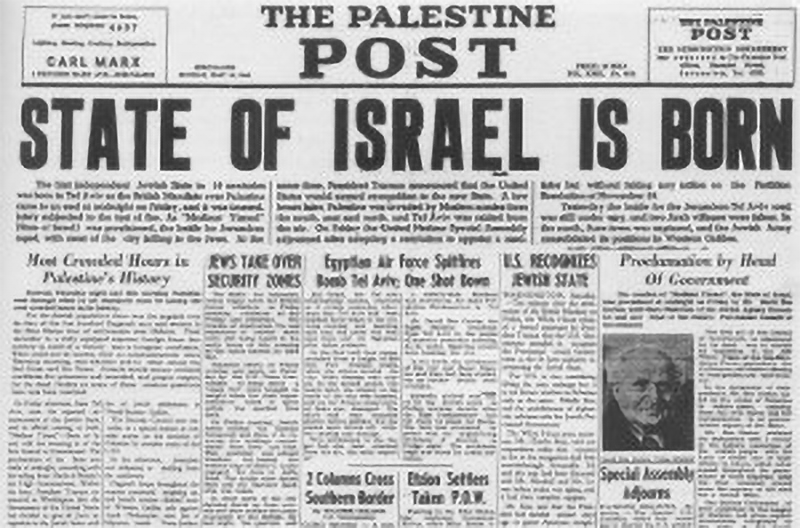 Israel, a nation had not existed as a separate nation for thousands of years, was declared a new sovereign state by an act of the United Nations, on May 14, 1948. The nation was born in a day. “Who has heard such a thing? Who has seen such things? Can a land be born in one day? Can a nation be brought forth all at once? As soon as Zion travailed, she also brought forth her sons.” Isaiah 66:8. The first returning Jews came primarily from eastern Arab countries. The next major movement came from the western countries of Europe, especially Germany. Then they came in great numbers from Russia – north during the end of the 1980’s. The last great migrations of Jews returning to Israel came from Ethiopia in the south. This is precise order of return that was predicted by Isaiah the prophet thousands of years earlier. 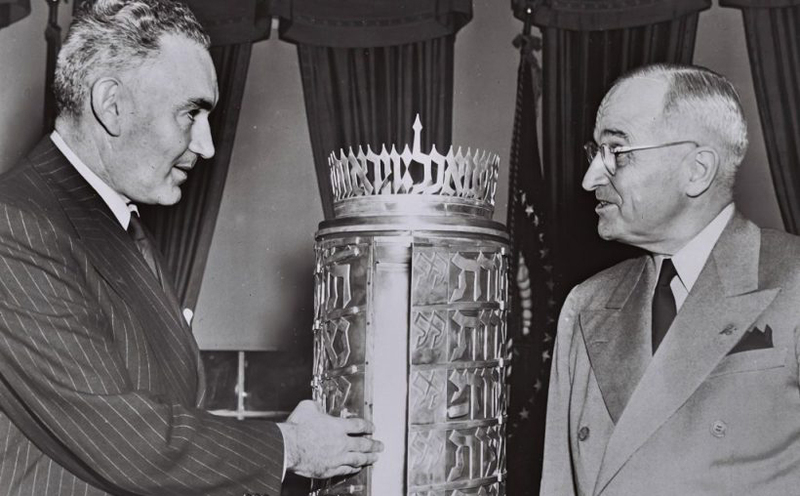 Although the United States supported the Balfour Declaration of 1917, which favored the establishment of a Jewish national home in Palestine, President Franklin D. Roosevelt had assured the Arabs in 1945 that the United States would not intervene without consulting both the Jews and the Arabs in that region. The British, who held a colonial mandate for Palestine until May 1948, opposed both the creation of a Jewish state and an Arab state in Palestine as well as unlimited immigration of Jewish refugees to the region. Great Britain wanted to preserve good relations with the Arabs to protect its vital political and economic interests. The Israeli Declaration of Independence, formally the Declaration of the Establishment of the State of Israel was declared by the United Nations. Unfortunately the western sector of Jerusalem became its capitol but the eastern sector (including the Old City) was annexed by Jordan and ruled from its capitol in Amman. The Jews living in the land since the time of Abraham were at the mercy of the enemy yet again. 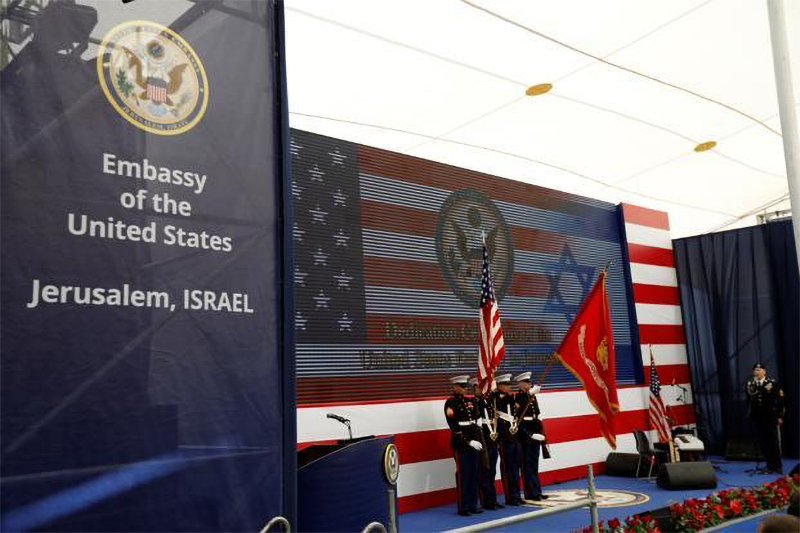 Miraculously, Jerusalem, the capitol of Israel was united after the six-day war in 1967 and finally after decades United States declared in 2018 what God has ordained since the beginning of time – Israel’s eternal capitol is Jerusalem.